The Giant Claw is a film that I saw quite a while ago so this review’s been living on the backburner. It’s not particularly noteworthy, but at the same time the film does really succeed on all of the fundamentals of making a giant monster film. 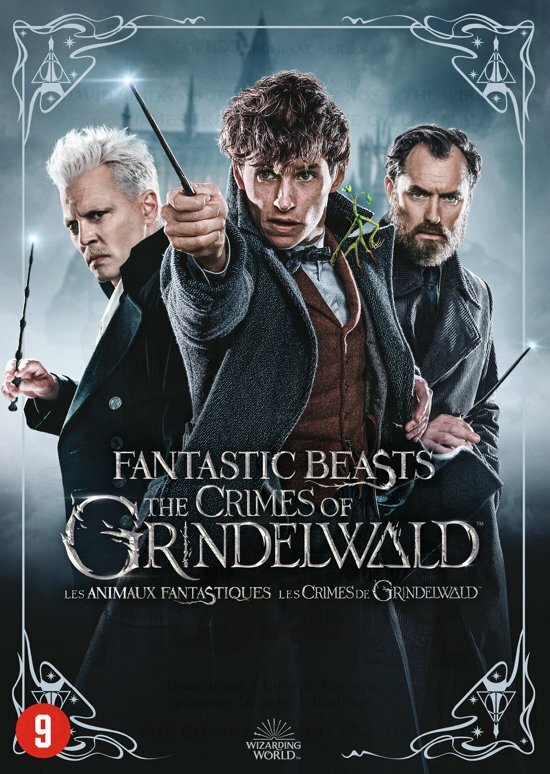 You’ve got a solid cast, a good monster, and excellent writing throughout. It’s probably one of the better American monster films and yet you just won’t remember it much when you’re done. After all, why watch this one when you can go check out a Godzilla film with Rodan? The film starts off with Mitch test driving a plane. He’s more of an electrician than a pilot, but he likes being in the air. 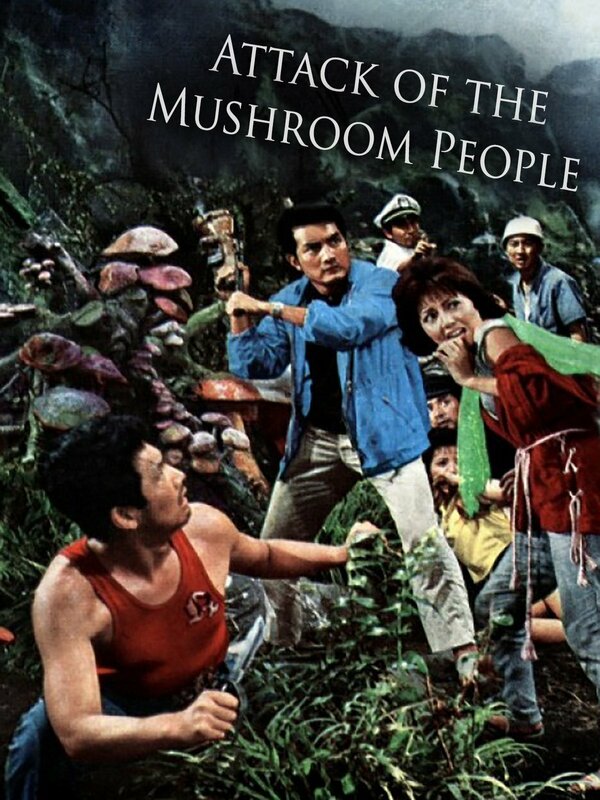 Unfortunately he sees a giant monster and alerts the government so some pilots scramble to stop it. This leads to one of them vanishing and everyone blames Mitch. They believe he was making things up. They start to sing a different tune once more pilots start getting knocked out of the sky. Now the real question is whether they can even stop this monster! I liked the monster’s design. He looks like a giant rooster and has quite the appetite. You should hear the way he crunches up the competition! The film does a good job of introducing this bird as a serious threat and he really does terrorize the world. When you think about it, that’s why a flying Kaiju is the scariest creature of them all. You can’t escape a winged menace and you certainly can’t corral it. Meanwhile Mitch is a pretty good main character. He’s immediately introduced as a bit of a rebel. Since he doesn’t work directly for the army he is able to get away with a lot more like driving crazy and talking back to the government. Mitch does have the bad tendency of getting awful sulky very quick though. Everyone tends to hurt his feelings and he always starts out talking tough but ends up losing the verbal battle by the end. He does do a good job of trolling the heroes at the end when the machine seemingly blows up though. He didn’t mean to troll them of course, but it worked out just right so he played along. Considering the stakes that was definitely impressive. It’s just his bad luck that everyone is pretty skillful at arguing in this film. It came out in a time when the writing was absolutely dynamite for these movies. I wasn’t surprised in the slightest to see that this was the case here as well. It really lets you get into the film and fully appreciate the drama and story. There isn’t a very large cast as it’s really just Mitch and the heroine. Sally’s a good character as well and does come up with the best plan in the film. Everyone else forgot that there were cameras in the area that could spot the bird. Of course, Sally was in the best position to realize this since it was her project which involved the cameras. It was a good way for her to contribute and in general she does a good job here. She doesn’t faint or anything and is always right in the thick of the action with Mitch. She even uses a gun herself which was definitely nice. She’s a pretty good shot as well. Now you may be wondering which side I was on, well I was definitely rooting for the giant bird. The humans end up shooting his eggs to prevent the birds from multiplying and in that moment I knew that the bird was the only creature who deserved to win. The baby birds in the eggs didn’t ask for any of this. As for the Giant Bird, it’s definitely pretty emotional when it goes down for the count. It did a pretty good job and took down a lot of opponents, but in the end the army was just too much for it. There is one really random scene where a bunch of teenagers show up in a car and start mocking Mitch. Naturally they’re all quickly eaten, but the scene just comes out of nowhere. It’s so random that it would be funny if it weren’t so tragic. I don’t think the scene is meant to be for laughs of course, but you definitely knew that the teens were gonna be in trouble as soon as they showed up. 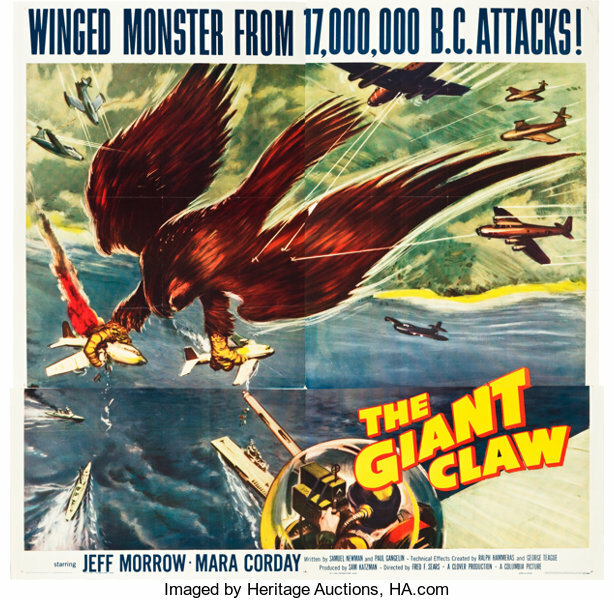 Overall, The Giant Claw is a pretty solid film. As I mentioned, it really succeeds in all of the fundamentals so that guaranteed that it would be solid. It doesn’t really do anything all that special and it’s pretty basic, but that’s why execution is always so important. If the film is weak at anything it just does have a bit of a rushed climax. Once they get the tech to stop the barrier and confront the bird it’s all over as soon as it has begun. I suppose without the shield the bird isn’t all that strong so it makes sense, but I would have liked for it to have fought them off a bird more. All films have to come to an end at some point though so I suppose it makes sense. If you haven’t checked this film out yet then I would recommend changing that. It’s not a well known monster title, but as long as you like the genre you should definitely be able to get behind this one. It’s time to look at a very recent horror film that I hadn’t heard of before watching it. This film really flew under the radar. Granted, I’m not the biggest expert on films coming out and all that, but I like to think that I still know most of them right away. This one is actually not bad for a horror title. The genre in general has a hard time succeeding with me, but this one avoided most of the pitfalls. The film starts with our lead Kit getting into trouble yet again. After her father died she has turned into a bit of a juvenile delinquent and the schools can’t handle her. Fortunately, the head mistress of a school for the troubled shows up and offers to take Kit in. Since at this point it’s between the school and prison, the parents take Kit there. One big red flag is that the entire school is made up of only a handful of other kids who arrive the day after Kit. All of them have one specific talent which appears to be growing fast under this school’s tutelage. Maybe this place isn’t so bad after all! Of course in a film like this it is never so easy for the heroes. It turns out that the villains have a convoluted plan involving possession and body transfers using the souls of the dead. As the main characters are fairly young it isn’t as if they have a whole lot of willpower. Also, while they have gotten mixed up in their fair share of crimes, they haven’t become total villains yet. It seems like the spiritual villains here are bad to the core and so they have more willpower. It shouldn’t work like that of course but the only heroic spirit here isn’t able to d a single thing. I’m talking about Kit’s father. He shows up once in a while but ultimately doesn’t really contribute. It’s hard to say if he could even see Kit half the time. I want to say that he couldn’t because the alternative is that he was turning a blind eye to the situation. The film has some intense visuals like the best friend being chained up and turned into a demon and the house being on fire made for a solid climax. However, the jump scares are pretty forced and do not work so well. It’s not really an intense horror title in that sense as the atmosphere may be pretty tense but the film can’t capitalize on it. The good side of this is that the film dodged the animal violence angle and isn’t too violent. It’s more of a slow burner and then in the climax everything starts happening at once. I do think the villains wanted too long to make their move though. The way their possession works seems highly inefficient. It’s like they have to nurture the kid’s talent which then turns them into a better vessel. Then they just play some more and run around until they have enough power to do something else. Problem is that it is still easy to kick them out when you have a third party helping and then their plan is down the drain. I guess it’s nice for the heroes to actually have a supernatural opponent they can take on for a change though. Most of the girls don’t really get much in the way of character but the ones who do get a personality are reasonable. Kit is a solid lead, she never backed down when the bully (Veronica) would make threats. She would probably lose the fight but at least Kit won’t run away. Veronica gets a lot of character development as well and is decent by the end but from the initial threats I feel like she is pretty far gone at this point. The others are all red shirts (If you saw the original Star Trek show then you’ll know what I mean) so it gets pretty dicey for them. That’s why you should always try to stick by the main character so her plot armor can protect you. Otherwise it’s basically over. Kit’s parents are actually pretty reasonable here as well. Sending her to the school makes sense in the context that they tried every other option and they kept not working. Plus, they at least did tell her to stay in contact and rebound guy #1 told her that they’d come get her if she didn’t like the experience. Anything shady happens and they’ll be right over. Instead of actually doing this when given the opportunity Kit just pretends that it’s all okay. She should have spoken up though as there’s not much that the head mistress could do by this point. Even if she slammed the phone or tried to tell the parents not to come that wouldn’t fly. Then they could have done an investigation or something. If Kit was staying to help the other kids and felt that this would put them at risk then I suppose it’s a fine call. Still, I thought it was good that the parents gave her a choice like that and clearly still cared a lot for her safety. Then you have the teachers who all have their own motivations for being here. The music teacher is the only one who is really out of his depth here and naturally that leads him into the romance plot which fortunately doesn’t get much screen time. It’s all way too sudden to be believable. Naturally the head mistress gets the biggest role out of these characters and she certainly makes sure the characters know that she is the leader. She mostly acts the part of the polite but stern mistress at the school and never really breaks the act to be real crazy. She’s a fun villain and you definitely want to have a composed mastermind character like her at the ready. Overall, This definitely isn’t a horror movie that you’ll still be talking about in a few days. 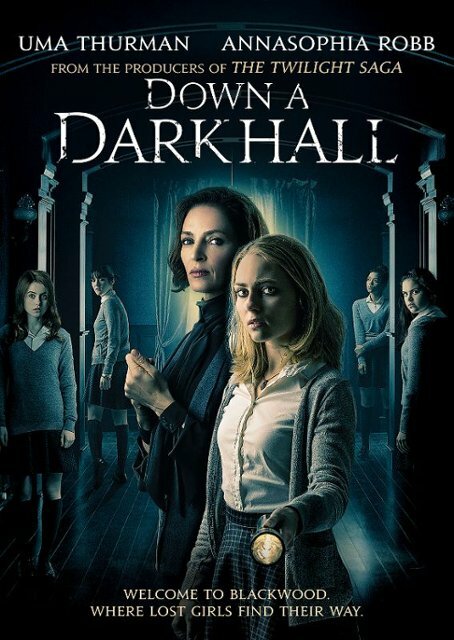 It definitely could have been a lot worse though as at least it is still pretty entertaining and doesn’t go too far into trying for shock value. At the same time there isn’t really much of a reason to check this movie out in particular. 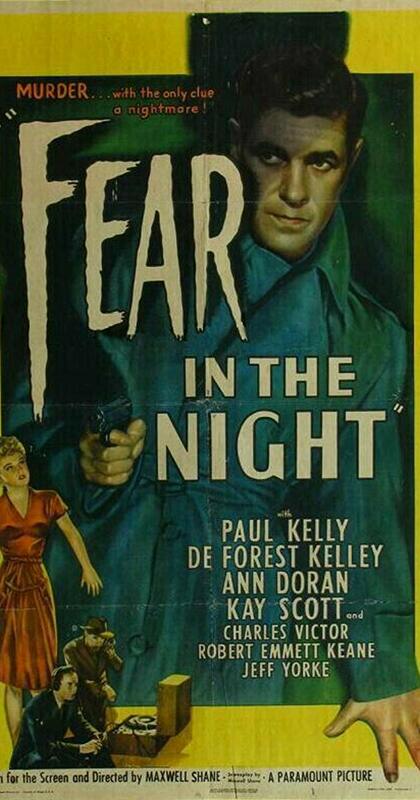 There are better horror titles to watch so only see this if you’re a big horror buff. It’s time to look at a fairly old Disney film. You’re probably familiar with the name whether you’ve seen the film or not. It’s definitely a very catchy title, although it paints a few warning bells right away. For starters, films with dragons usually take place in the really olden days where so the film won’t really be visually pleasing. Dragon films just don’t tend to have the best track record and unfortunately this one doesn’t really change that melody. The plot starts off with a group of people heading to the lair of a sorcerer. They have come to ask for his help in slaying a dragon. This is the last dragon haunting the kingdom, but currently it is basically impossible to stop him. The sorcerer agrees to help, but he is quickly murdered by some of the king’s men. They don’t want anyone to try and attack the dragon because if that person were to fail then the dragon would just get even more upset. This band of men also murder the sorcerer’s right hand man so now all that’s left is the apprentice. Galen tells the group he’ll slay the dragon and sets off to do so. Still, he is just a boy…can he really stop this mighty beast? Galen won’t really leave a positive impression with you. First off, he’s incredibly overconfident. From how he talks and swaggers about you would expect him to have a considerable amount of magical talent at his disposal and yet we see that he can barely even lift a table. That’s certainly not an image that will inspire confidence into your heart. On the contrary, it’ll just let you know that you really can’t trust this guy. Then when the group is just trying to get by the dragon territory so they can make a plan he decides that he absolutely has to see the lair. Galen puts all of their lives in jeapordy just for that. Then he doesn’t even see the job through. He’s just a pretty bad main character and I don’t blame some of the characters for being upset with him. Of course, the King and his men are portrayed as unreasonable. While they may have some valid complaints, they are completely overshadowed by the fact that they’re petty and corrupt. They just want to keep sacrificing everyone so the dragon will stay quiet. Since the rich are exempt from the sacrifice, it’s of no concern to the King. It only becomes a concern once his daughter is in trouble. Of course, he is a villain, but at least he’s consistent about it. It makes him a fun antagonist since he has no moral compass and only does what is best for him and his family. The leader of his guard who fights with the heroes probably gets the more screen time from the antagonists though. He does put up a good fight each time and in terms of swordplay might be the toughest fighter in the film. The main heroine gets a big role as well. The twist likely won’t work too well for most since it seemed pretty clear that Valerian was a girl from the start. I suppose as long as the trick worked on the other characters then that’s what counts though. She was definitely helpful throughout and without her the main guy would have definitely gone down for the count several times. The rest of the supporting characters don’t really do much. To go back to the sorcerer though, I can’t say that I liked the guy. Of course towards the end it turns out that he did have some kind of master plan and all, but at the end of the day he still allowed himself to be destroyed and the rest of the group could have easily fallen right after that. He’s just lucky that the villains decided to leave. For the most part if you take away the fact that this isn’t really my kind of film then it’s not that bad. It’s still a lot more engaging and fun than something like LOTR. The cast may not be particularly strong, but it’s still a reasonable adventure. 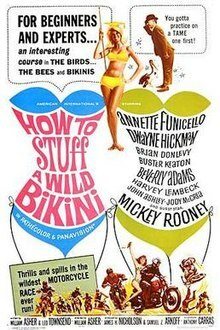 Unfortunately the film begins to falter towards the second half. 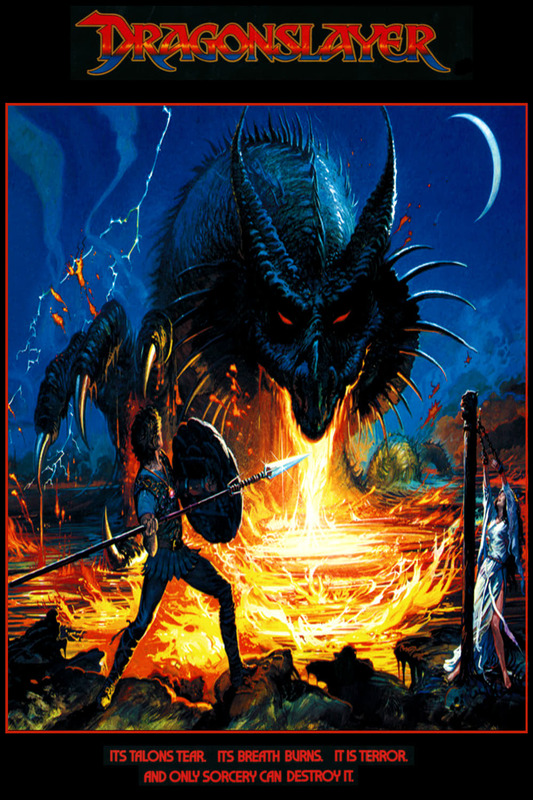 It actually gets pretty violent once Galen goes in the cave and starts slaying the dragons. We even see one of the characters get ripped to shreds. It is definitely unfortunate for her since the only reason she was in that spot in the first place was because she tried doing something noble. I was really expecting her to get saved. Still, while offering herself up as a sacrifice was a heroic move, she should have just let the main character save her the second time around. Running into the cave like that just wasn’t good. So, the climax hurt the film because with all the stabs and the violence it was basically animal violence. Dragons differ from monsters in that respect. The visuals age pretty well though. The fire blasts from the dragon are surprisingly lifelike and I like the shield that the hero used. So if you just take away the dragon part and make it some kind of inanimate object instead then maybe the climax would have been really awesome and overall the film would have been a big success. After all if not for the climax then this film would earn a few extra stars at least. A shame that it had to go down right at the very end. Overall, Dragonslayer does live up to the title. It’s a pretty long film, but the pacing is pretty decent. Even if the intro is slow, it does set up the characters and does so without a lot of exposition. Then when we get to the action part we get multiple fight scenes. Even the old sorcerer gets to fling a few lightning bolts. I will say that the Dragon was definitely very persistent. He just kept getting up no matter how many people kept trying to strike him down. The film even makes him sympathetic at one point when he sees that Galen is murdering all of his kids. That’s when I remembered that I was rooting for him all along. He should have ended the village ages ago though instead of taking his time. 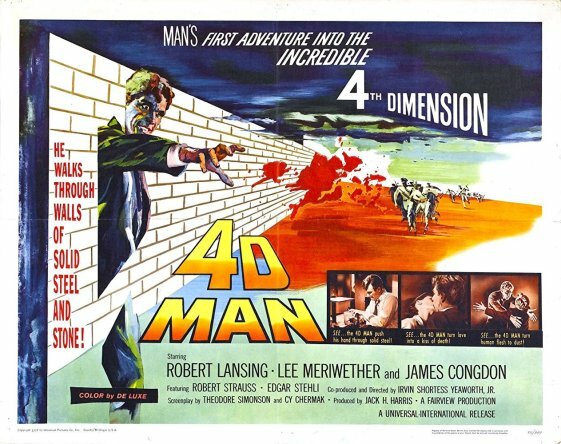 So, I don’t recommend this film, but if you really love old school adventures then you may like this one. Just be prepared for an annoying main character. He doesn’t do the film any favors. It’s time to look at an old western film. This one doesn’t take itself quite as seriously as the last few and sort of goes for a more classic LOTR adventure type feel instead. It works pretty well and this very nearly became the definitive western for me. Unfortunately it does fall into the animal violence trap by the end which was pretty unfortunate. Still, it does at least still succeed at being pretty entertaining from start to finish. The film starts off with Marshall Cowan getting attacked by Indians. Just as he is about to be finished off his old friend Catlow shows up. It’s a mixed outcome for Cowan as he is glad to be saved of course, but Catlow is now a wanted man who has been stealing cattle and gold. Catlow’s defense is that he only steals unclaimed things which is true on a technical level, but the town is corrupt so Cowan still has to bring him in. They may have been the best of friends at one point, but right now their jobs are their top priority. This leads to both characters engaging in a back and forth fight where neither one will surrender. Catlow’s ultimate goal is to steal a massive shipment of gold so he can retire nicely while Cowan has to stop him. Meanwhile you have Miller who has a personal vendetta against Catlow and wants to end him. Who will come out on top? I definitely liked the tone this film went for. The banter between the characters is great and they constantly get the other one to take a humiliating loss. Both Catlow and Cowan can hold their own scenes pretty easy. Even while threatening each other they manage to stay civil. At the same time, both of them are willing to push the trigger if it came down to that. There’s a lot of tension under the words they share which is interesting in itself. At the same time, they’ll also go out of their way to save the other. The film is filled with great moments like this and that’s why it’s a lot of fun. The film could have possibly gone on to be an 8 star title. Alas, there are horses in this film as it’s a wild west. It’s always a red flag for me. There doesn’t necessarily have to be animal violence in these titles, but typically if you see a horse then you know what’s going to go down. In one of the fights with the Indians they specifically target the horses which was unfortunate. When that happens the film is destined to lose quite a few stars. It’s the number one mistake that most films make and this one was no exception. What makes it tragic is the fact that the film was solid otherwise. As I mentioned, Catlow is pretty fun. He’s a smooth talker and is great at thinking outside the box. He handles the climax of the film exceptionally well as he gets to act like a sheriff. It was a pretty smooth move on his part. Meanwhile, Cowan may not have quite as sharp a wit as Catlow, but he is able to keep up pretty well. You don’t want to underestimate either one of these combatants. As for Miller, he’s a pretty fun main villain. I’d say his best scene is the first one he appears in. As with the main characters Miller does have a flair for the dramatic. He has fun toying with Catlow although he definitely did get pretty overconfident there and it cost him big time. Still a fun addition to the cast. In that respect, Miller and Cowan continue to make the mistake of underestimating Catlow and his gang. They often have the thief on the ropes, but take so long gloating that he manages to get away. They seem to forget that he has a whole army of supporters backing him up. He’s also just got a bunch of connections like how every village seems to be under his thumb. I think it all goes back to his smooth talking ways. The lady with him also has a lot of influence. I do question how she managed to beat everyone to one village when they had such a huge head start, but that’s a head scratcher for another day. There is one scene that really makes no sense though. It’s probably the one main moment that may throw off the immersion for you. Catlow and his gang infiltrate a kingdom and take down a huge chunk of the army one at a time. They wait until the sleepy soldiers are passing through a passageway and then lasso them. Catlow then knocks the guard out and they keep repeating this until they have them all. None of the guards think to yell and they all go down like chumps. Sure, they were sleepy and potentially drugged, but really? At first I thought the guards were all in on it, but they only pretended to be the main 2. The rest should have been able to do something. It’ll probably make you either chuckle or roll your eyes. As this film is mainly a comedy anyway I wouldn’t call it a negative. I don’t think the film meant for you to take it seriously anyway. 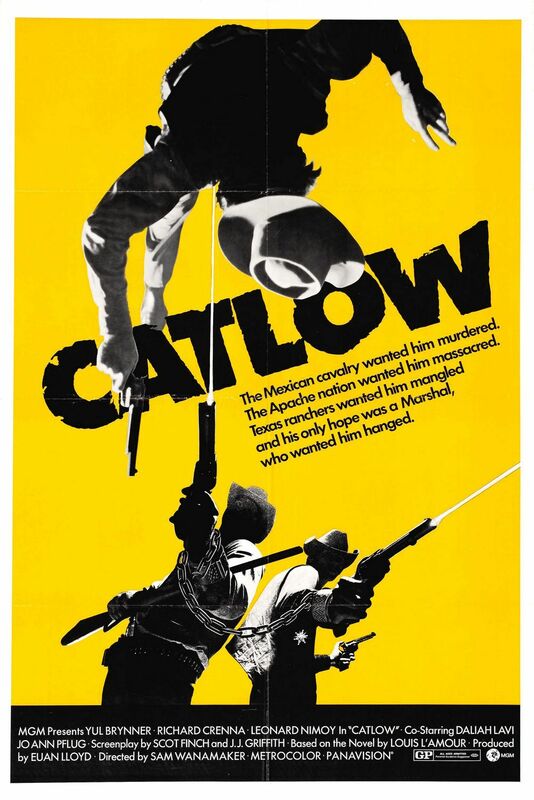 Overall, Catlow is definitely a very fun film. It’s probably the most enjoyable western that I’ve seen and the writing is absolutely on point. The main characters all do a great job at being entertaining when they’re on screen and the plot is sound. There’s really only one main negative here which is the animal violence and unfortunately it is absolutely killer. The film just couldn’t recover from this, but the important thing is that it came close. If you can stomach the horse stuff then this is definitely a film I’d recommend checking out. Otherwise check out a different one like Hang em High.